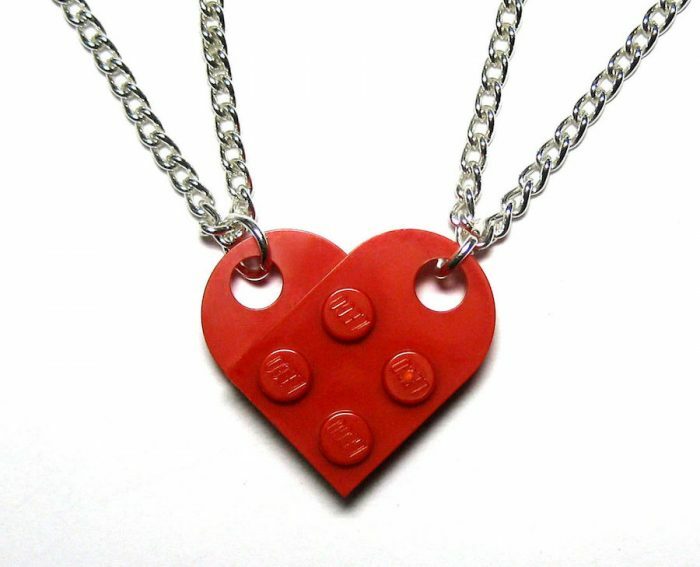 Our kids are obsessed with best friend necklaces — you know, like those traditional split heart charms on a chain that allow you to each wear a half. 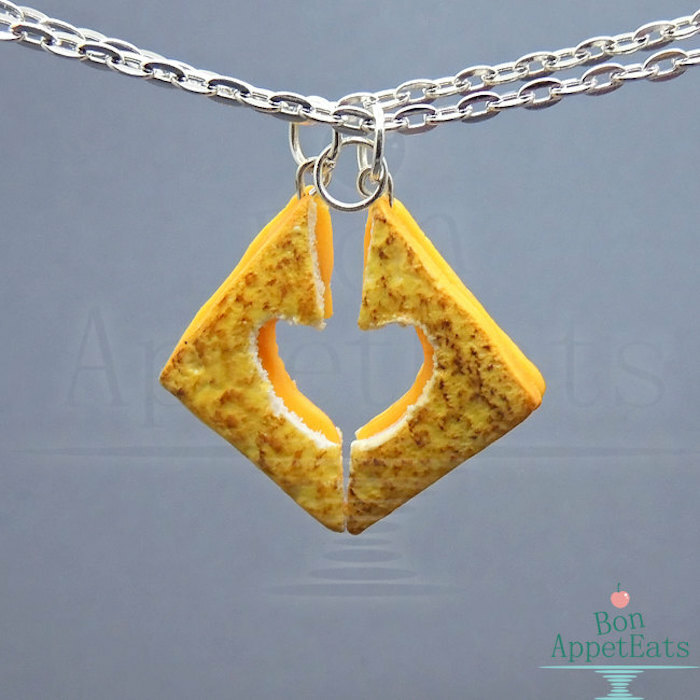 Whomever came up with that very first split-heart, yours-and-mine necklace…pure genius! But the idea has gotten gotten so much more clever over the years. 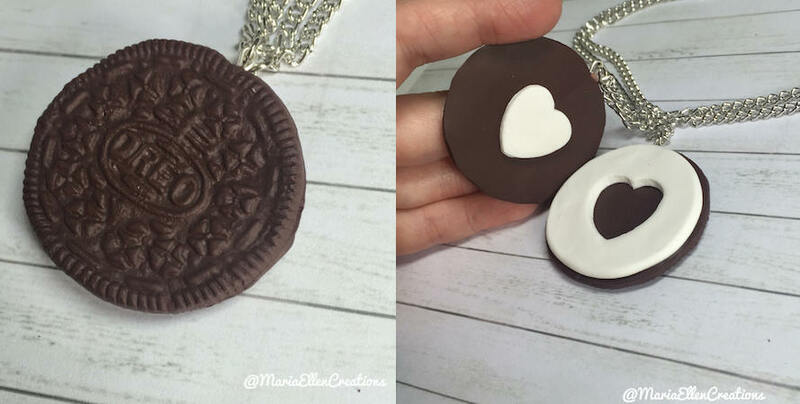 If you’ve got a kid shopping for a BFF Valentine’s Day gift, or maybe you even want to honor a bestie of your own, I’ve put together (heh) a list of some of my favorite new best friend necklace finds. 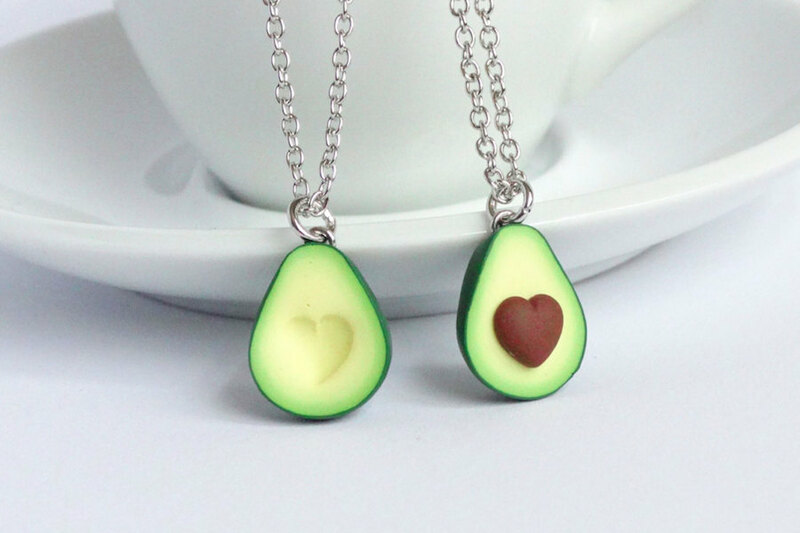 This adorable rendition of the world’s yummiest superfood is the perfect, Millennial-friendly way to say “you are the avocado to my toast.” I’m bummed that it ships from overseas but you know, so do a lot of avocados that aren’t made of polymer clay. 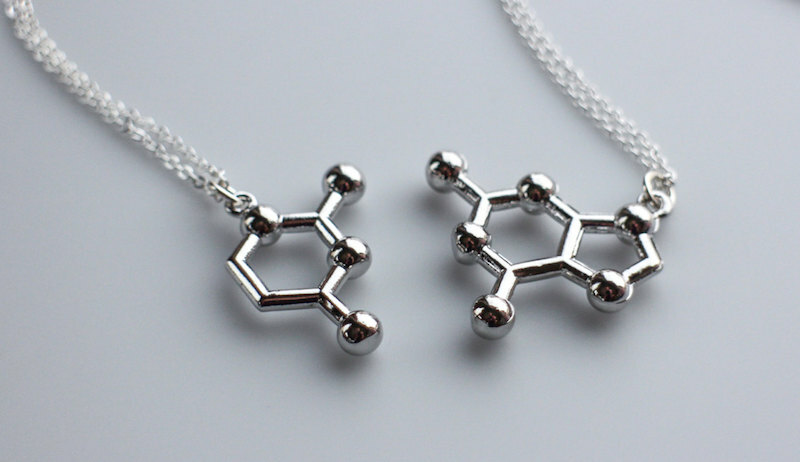 Lots of best friend necklace charms look kind of weird when they’re not with their other halves (i.e., pretty much always), which is why this set is so lovely. 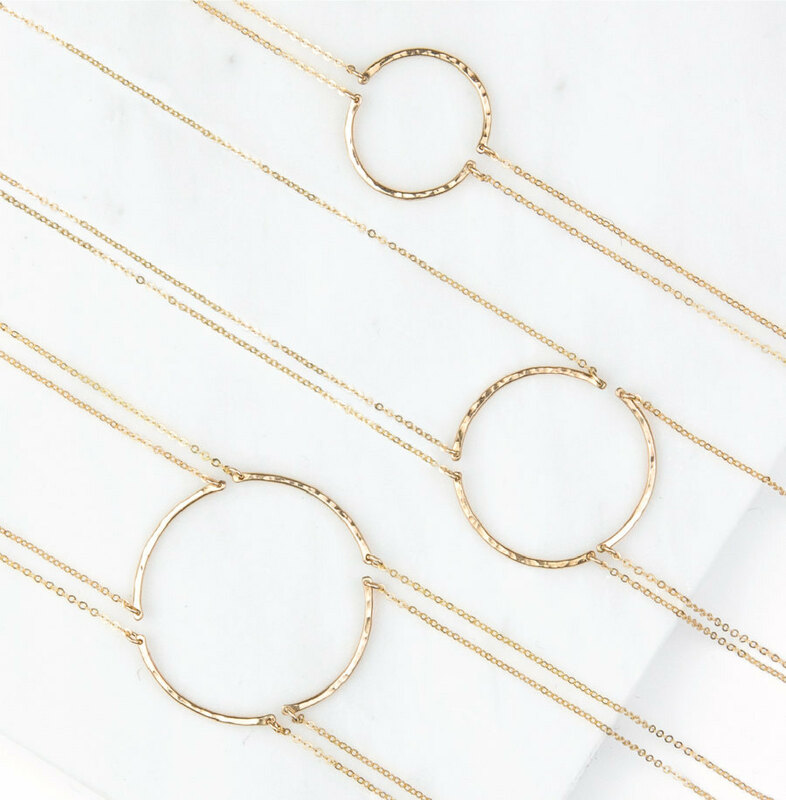 Together, you can order 2, 3, or even 4 pieces that fit together to form a sterling or gold circle. But they’re cool when they’re alone too. What a perfect metaphor for great friendships. Related: Glam gift ideas for your fab BFF. Mostly so you can borrow them. Love that you can order two different colors for each side if you want, and the top half isn’t quite so heart-like — perfect for a male sweetheart or BFF. 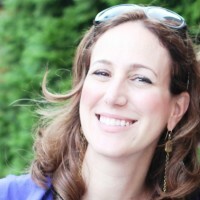 One warning: when you’re not wearing your own half, keep this best friend heart necklace away from the kids. I know mine would turn up in one of my 7-year-old’s LEGO creations! Because best friends complete each other, each half of this DNA base pair requires the other to even exist — it’s science, people. 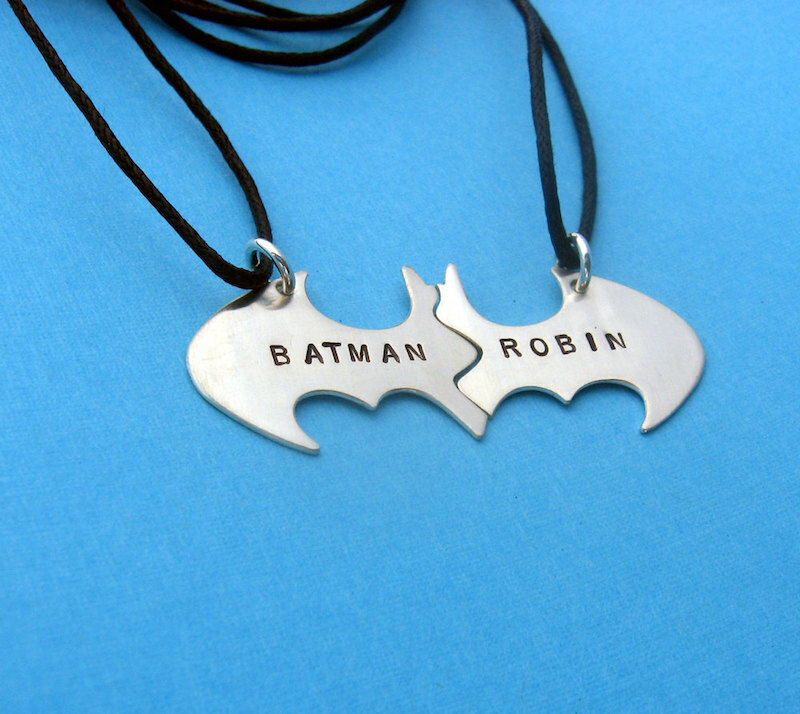 You can personalize these two bat-signal split charms with any names you want, but I think “Batman” and “Robin” pretty much say it all. Unless “Batman” and “Bruce Wayne” or “Batman” and “Catwoman” somehow suit you better. 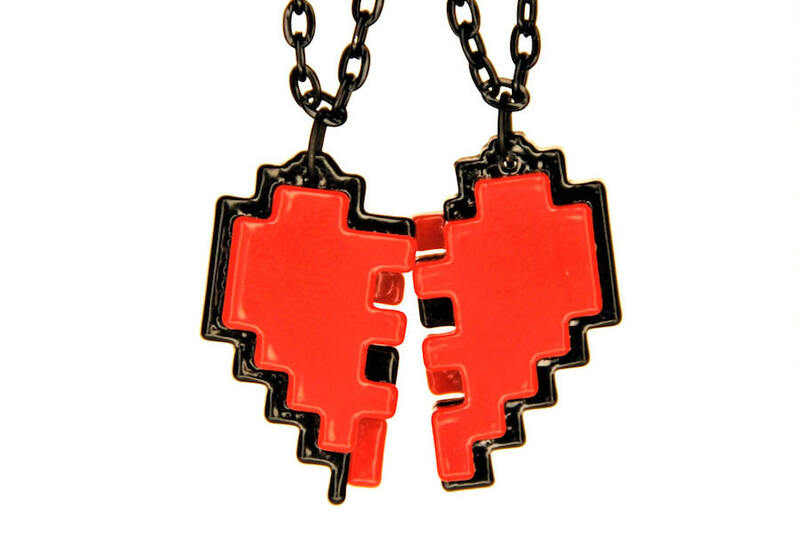 This best friend necklace is a modern take on the traditional split heart necklace — whether you and your bestie grew up on 8-bit, or are just partners in geekdom forever. 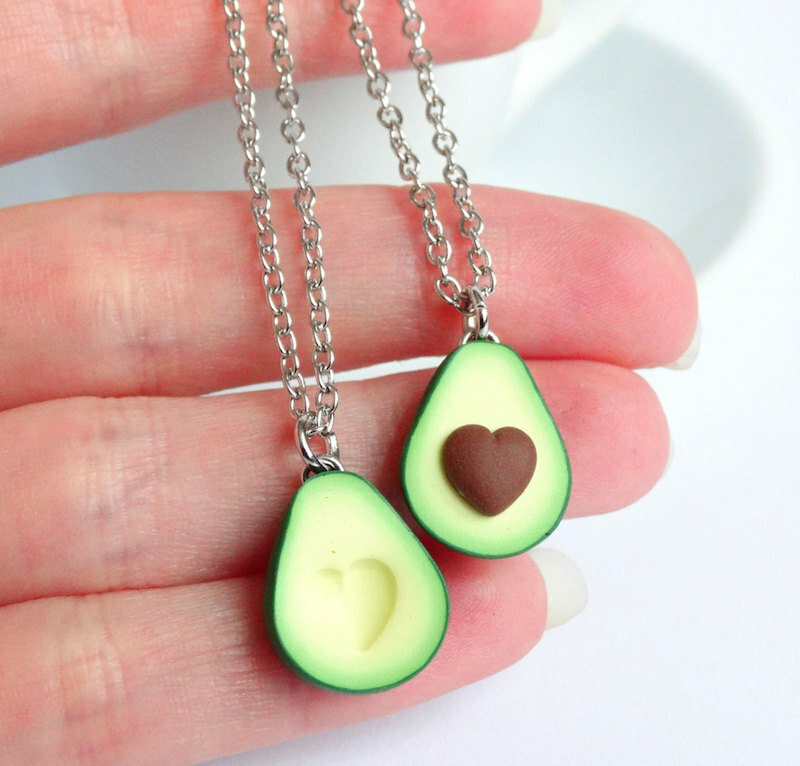 There are a lot of food options in the BFF necklace game, and it makes perfect sense. 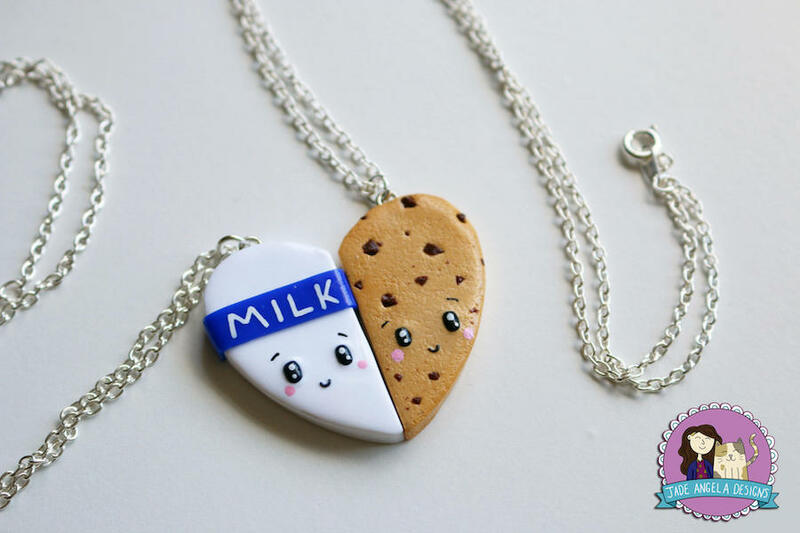 Some things — like this adorable milk and cookies set — just go better together. This is one of those pieces of Valentine’s Day BFF jewelry that might require some explanation when it’s not seen with its other half. But who cares? It’s grilled cheese! One of the things my mom did for me when I was a teen, which was adorable…..she crocheted me a red wool heart, which had a safety pin on the back. I wore my heart on my sleeve for years, as I switched it from sweater to sweater. Wish I still had it. Oh my gosh, that’s the sweetest!